The satellite photo showed the big mass rumbling south from the Gulf of Alaska. The rain started on Friday. It rained most of the weekend and was still raining this morning, Monday. One of those mornings when you cast a bleary eye up to the heavy sky, fill the thermos with hot soup, pull the hood of the raincoat over your head and plunge out the door. We had ambitious plans for the day. But when the road was covered with two inches of slushy snow and we were still ten miles from where we needed to start our hike, the plan changed. It would be a good day to clean some drainage ditches on the Waptus River trail. We hunkered into our rain gear and packs, then set out. The Cooper River roared–haven’t seen water that high since springtime runoff. Rainwater flowed down the trail. With the slice of a shovel at just the right place in an earthen berm, water will flow out of a puddle and off the trail. The same tool can hack out a blob of dirt and rocks plugging an angled drainage dip. Standing with a shovel in my hand watching water run takes me straight back to childhood in rainy southwest Washington. You went outside to play in the rain, or you didn’t go outside. Manipulating running water by digging ditches and building dams was early practice for a task I now get paid for. So gratifying to watch a small stream change course. There is a feeling of play for me, a sense of connection to the runny-nosed half-damp child that I was. And still am. A mile from the trailhead, I looked at my companions and listed our options: keep going or go back. We opted for lunch in the truck and the afternoon to dry ourselves and our gear. Still raining and 35 degrees is perfect hypothermia weather, and who needs that? 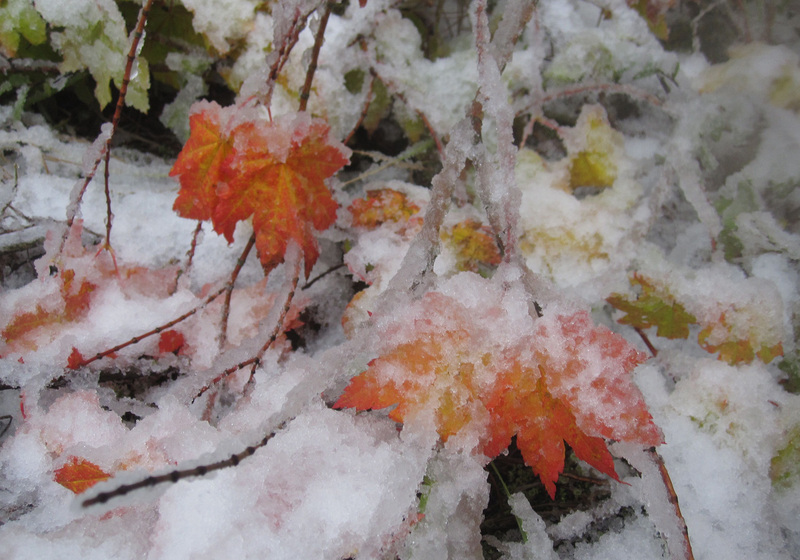 Walking back, I watched the water running out the ends of the ditches, observed the sloppy consistency of the snow, the vine maple colors only now beginning to change. Thought about previous October days working in shirt sleeves. Is winter early this year? Time will tell.